A: Our trolley tours last about 3 1/2 hours and the haunted craft beer walks average about 2 1/2 hours. Q: Do people actually experience a ghost on the tours? A: Although apparitions have been seen on our tours, we can never promise something will happen. 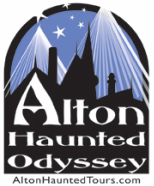 Q: Why is Alton so haunted? A: We think it is a combination of three things: the confluence of the rivers, the huge amount of limestone and the traumatic events that are part of Alton's history. Q: Will we get interesting photos? A: Most people do. Orbs and strange lights are most common, but occasionally someone will capture an entity in a photo. If you get something good - we hope you will share it with us! Q: Can we bring alcohol on the tour? A: Sorry, we do not allow alcohol on the trolley tours - out of respect to our non-drinking guests. If you enjoy adult beverages, try the new Haunted Craft Beer Walk which includes five different five-ounce pourings of Old Bakery Beer in five different haunted locations! Q: Where do the tours begin? A: All tours begin at My Just Desserts, 31 East Broadway in Alton, IL. The building is both historic and haunted. ​Please refer to the map on the "trolley tour schedule" page.